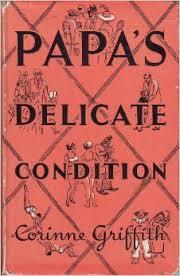 Pappa’s Delicate Condition (1952) by Corinne Griffith is an autobiography I discovered while watching the movie by the same name. What truly fascinated me about this book is that Griffith was a silent film star. After her movie career ended, she became an author. Hers is a real life Singing in the Rain story. Griffith had a successful career in film until the talkies came along. This novel is the story of her early life in Texas and New Orleans. In particular, it is the story of her relationship with her father – a man she clearly idolized. Mr. Griffith enjoyed his libations; a sentiment not shared by the rest of the family, and understandably difficult for a young daughter to comprehend. Being with Pappa was an adventure! I greatly enjoyed this colorful story and am grateful Griffith turned to writing after retiring from acting. She weaves a good tale. This entry was posted in Uncategorized and tagged autobiography, Books, circus, Corinne Griffith, Ghio, New Orleans, railroads, silent films, Texarkana, Texas. Bookmark the permalink.